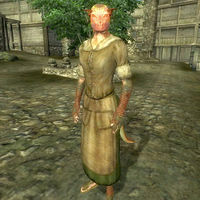 City-Swimmer is an Argonian agent living in Bravil who offers basic training in Sneak. She owns a lower-class second floor condo in the northeastern part of town and she sleeps there every night between 10pm and 6am. After waking up, she unlocks the door and spends the next two hours relaxing inside. At 8am, she sits down and eats her breakfast until she finally ventures outside at 10am. For the next ten hours, she wanders around the northern part of Bravil, regardless of weather. At 12pm and 6pm she gets hungry and will, due to her low responsibility, never shy away from stealing food from the townsfolk passing by, a behavior that often results in trouble with the patrolling guards and her untimely demise. She returns home at 8pm and spends the last two hours of the day in the apartment before she finally goes to bed at 10pm. She will offer services at all times, except when she is eating or sleeping (see notes). She wears a set of typical lower-class attire, a collared shirt, a pair of green felt linens with sack cloth sandals. She carries only her key and a bit of gold. When you approach her for the first time, she will introduce herself with the words: "Does anyone see City-Swimmer? Is he gliding beneath the silver water? Is he creeping 'round a corner, hugging a wall, silent as a shadow in the dark? No! I am here! I stand proud before you, City-Swimmer, trainer of the prospective Sneaker, the sly sliding unseen!" When you ask her about Bravil she will tell you what she believes to be the ultimate challenge: "What? You have not eyes to see? The castle, of course! The only challenge worthy of a swift sneaker." Despite not being a member herself, she will provide a few useful tips about finding the Thieves Guild. Choose the Bravil option before having joined the guild and she will say: "Ha! Members of the Thieves Guild in our fair town? What makes you think that? Never! Absurd! Such fine law-abiding citizens are we all!" If you choose to thank her for straightening you out, she will just say: "You are most welcome." If you instead ask her about the Thieves Guild, she will answer: "Then you want to know about The Gray Fox. Want to learn more? Visit the Waterfront District of the Imperial City. Find the Garden of Dareloth at midnight. Then ask your questions." Keep your eyes on City-Swimmer. I don't know where she goes when she's not in the canals. City-Swimmer certainly lives up to her name. I've seen her in the canals many times. Did you see City-Swimmer swimming in the canals again? City-Swimmer is a bit odd, don't you think? I've heard that City-Swimmer has learned the value of not being seen. Quite impressive, and she'll teach it to others. I've seen her in the canals a number of times. Other times, I've seen her sneaking around the city. She's a bit strange, but I've heard she's rather good at not being seen, if you know what I mean. She's a sly one. I understand she's quite sneaky. When she wanders around town, she will sometimes deny you training. If that happens, just keep addressing her and she will give you the opportunity sooner or later. Due to her low responsibility, it is not uncommon for her to be pursued by the guards and killed for pickpocketing. To temporarily prevent this simply place food near her. Several characters speak about City-Swimmer constantly swimming around Bravil, but she is never seen doing so. Despite the fact that City-Swimmer is female, she refers to herself with male pronouns in her greeting. This bug is fixed by version 1.2.0 of the Unofficial Oblivion Patch.